This is the central question of this chapter. Question: how can we show that this proposition is actually true? Keep in mind, what we are asking here is not how we as human beings historically came to discover that one plus two equals three. Instead, the question is: how do we know this proposition is true? How is it justified? While it might be argued that it probably took centuries of human experience with the world before this proposition occurred to our ancestors, it is equally clear that we don’t need any experiments or observations to justify this proposition. Indeed, we don’t need to conduct any experiments or observations in order to establish that one plus two actually equals three at all times. But if it is not based on experience, then what is it based on? The answer is: the truth of this proposition stems from the very meanings of the terms “two”, “three”, “plus”, and “equals”. What do we mean by “two”? Setting aside the question of a precise mathematical definition of the concept, we can say that “two” roughly means something like “one and another one”. The same goes for the concept of “three”, which is essentially short for “one, another one, and another one”. But if that’s what we mean by “two” and “three”, then it follows deductively that one plus two equals three. In other words, this proposition holds true as far as “two”, “three”, and other terms are understood in the way that they are usually understood. Importantly, we don’t need to conduct any experiments or observations to ascertain that one plus two equals three at all times and in all places, for the proposition is true by virtue of the definitions of its terms. How do we know this? Once again, the question is not when and under what circumstances humans first came to appreciate the truth of the statement. Rather, the question is: how can this proposition be justified? What makes it true? Based on the results of these observations, we generalize and conclude that all swans are white. This inference from individual instances to a general proposition is called induction. 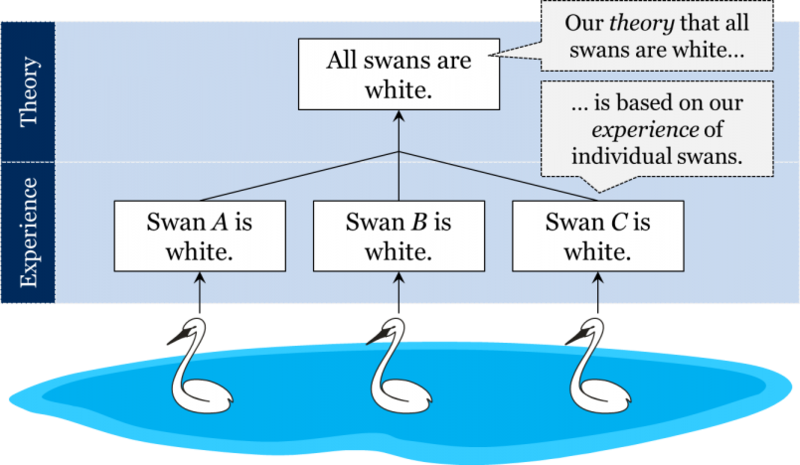 In short, we seem to agree that the proposition “all swans are white” is justified by experience: it is an inductive generalization of the results of our observations of individual swans. It doesn’t take any extensive knowledge of math to grasp the gist of the law. Here, F stands for the force of attraction between two material objects, m1 and m2 are the respective masses of these two objects, r is the distance between them, and G is a constant that we can ignore here. The law says that there is a force of attraction between any two objects in the universe; the greater the masses of these objects, the greater the force of attraction between them; the greater the distance between them, the smaller the force. In other words, the attraction between two objects increases with mass and decreases with distance. The same idea can be expressed in more technical terms: the force of gravity is proportional to the product of the two masses and is inversely proportional to the square of the distance. Now, how can we justify this proposition? How do we know it’s true? More specifically, can the law of gravity be justified independently of experience simply by virtue of the definitions of its terms, or does it take some experiments and observations to justify it? Is it similar to “one plus two equals three”, or is it similar to “all swans are white”? In other words, is it possible to show that this proposition is true simply by analysing the definitions of “force”, “mass”, and “distance”, or should we actually go out there and see how objects in the world behave in order to justify the law? Thus, there is no way to deduce the law of gravity merely from the definitions of its concepts, for there is clearly more than one way in which these concepts could be put together. But then how do we know which one of these numerous possibilities is true? The intuitive answer is that we have to go out and observe: there is simply no other way to know which one of these is the case without conducting experiments and observations. How might we do it? Perhaps, if we were to observe that it holds for the Earth and a falling apple, and if we were also to observe that it holds for the Earth and the Moon, the Sun and Jupiter, as well as for any two planets, then we could generalize and conclude that it holds between any two objects in the universe. In brief, intuitively the mode of justification of the law of gravity appears to be similar to that of “all swans are white”. The fact that the law of gravity can be expressed as a mathematical equation shouldn’t confuse us here. It makes no difference how the proposition is expressed: the same proposition can be expressed mathematically or in a natural language, but that doesn’t change the gist of the proposition. 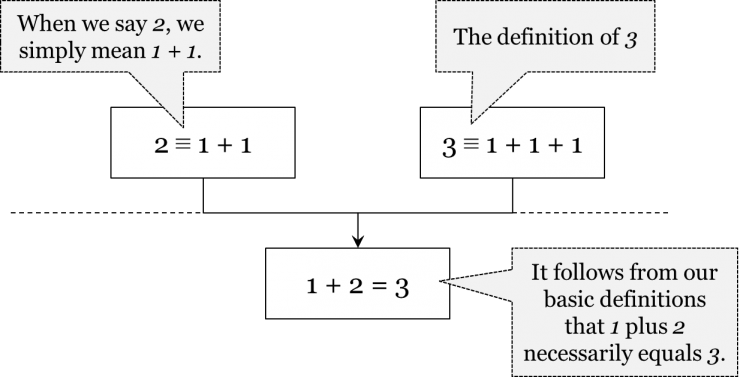 The same proposition can be expressed as “1+2=3” or as “one plus two equals three” – its truth follows from the definitions of its concepts regardless of how we express it. Similarly, we’ve seen how the law of gravity could be expressed both as a mathematical equation and as “the force of gravity is proportional to…” – it makes no difference. The important point here is that one needs to conduct experiments and observations to check if the law is true. Let us now appreciate that the three propositions we’ve discussed belong to two different categories. We say that the proposition “one plus two equals three” is an analytic proposition, while the law of gravity and “all swans are white” are synthetic propositions. Analytic and synthetic propositions are two distinct types of propositions. This proposition is true by definition, since “bachelor” is defined as someone unmarried. If someone were to claim to have observed a married bachelor, we would probably conclude that she uses the word “bachelor” differently, for it is impossible to observe a married bachelor, insofar as we stick to our common definition of “bachelor”. To express the same idea differently: an analytic proposition necessarily holds in all possible worlds, i.e. its opposite is inconceivable. Thus, the proposition expressed as “1+2=3” is true in all possible worlds, in the sense that it’s impossible to conceive of a world where this is not the case. Of course, we can always decide to change the definitions of our concepts and, for example, agree that “2” stands for “one, another one, and another one”. But that would effectively change the meaning of “1+2=3”; it would no longer be the same proposition. So as long as “2”, “3”, “+”, and “=” are defined the way they are commonly defined, the proposition “1+2=3” holds, come what may. This is clearly not the case for synthetic propositions. Synthetic propositions are ones that are not deducible merely from the definitions of their concepts. Because they are not deducible from the definitions of their concepts alone, they can potentially contradict the results of observations and experiments. This is the same as to say that synthetic propositions do not hold in all possible worlds, for their opposites are conceivable/imaginable. Thus, we can easily imagine a world where at least some swans are not white, or a world where the law of gravity is different. A centaur is a creature that is part human and part horse. The sum of the squares of the lengths of the sides of a triangle is equal to the square of the length of its hypotenuse: a2 + b2 = c2. All of the above propositions are such that their opposites are simply inconceivable, since they are either definitions or logically follow from definitions. In combustion, methane combines with oxygen to form carbon dioxide and water: CH4 + 2O2 → CO2 + 2H2O. The game of football is played in four 15-minute long quarters. There are no centaurs on planet Earth. It is easy to grasp that all these propositions are attempting to say something about the world we happen to inhabit and, consequently, they may or may not hold in other possible worlds. We can easily conceive of worlds where these propositions are false. Thus, we can imagine a strange world full of centaurs, or a bizarre world where Paris is the capital of England. We can also conceive of an absolutely ridiculous world where the game of football is played in two 45-minute halves. This brings us to a useful rule of thumb for distinguishing analytic from synthetic propositions: if the opposite of a proposition is conceivable, i.e. if it doesn’t lead to logical contradictions, then the proposition is synthetic. Conversely, if the opposite of a proposition is inconceivable, i.e. if it contains logical contradictions such as the idea of a married bachelor, then the proposition is analytic. 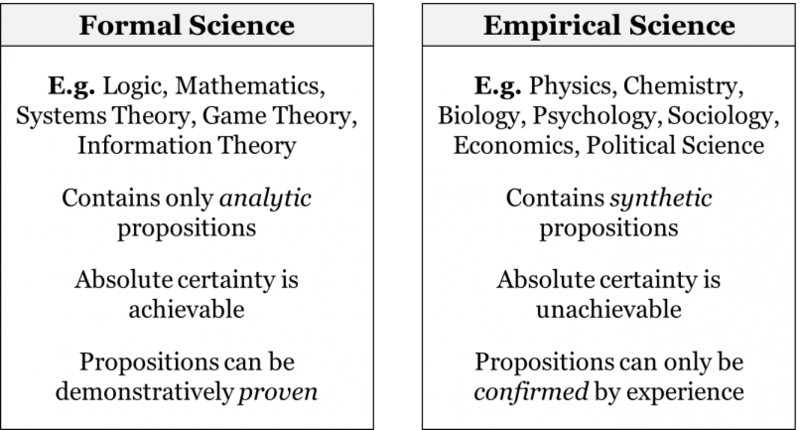 The distinction between analytic and synthetic propositions comes in handy when distinguishing between formal and empirical sciences. While in empirical sciences, such as physics, chemistry, biology, psychology, sociology, or economics, there are both analytic and synthetic propositions, in formal sciences, such as logic or mathematics, all propositions are analytic. It is the absence of synthetic propositions that characterizes formal sciences; indeed, all propositions of math or logic are either definitions or follow from definitions. The sum of the angles of a triangle is two right angles. But if it is possible to replace some mathematical propositions with their negations, then in what sense are they said to be analytic propositions? The answer is this: while some mathematical propositions don’t usually strike us as definitions, they essentially define properties of mathematical objects that are studied by that specific mathematical theory, and thus are veiled definitions. What makes this possible is the fact that the objects of mathematical theories are all formal, i.e. they do not exist independently of those mathematical theories that define them with their postulates and definitions. Thus, Euclid’s postulate remains an analytic proposition in the context of Euclidean geometry, whereas some other postulates would be analytic in Lobachevsky’s and Riemann’s non-Euclidean geometries. The same goes for the objects of any formal science. In contrast, theories of empirical science don’t have the luxury of defining the properties of their objects. The objects of empirical science – natural or social – are all assumed to exist independently of the empirical theories that attempt to describe them. Thus, physical processes described by a physical theory are not defined/created by the physical theory. Similarly, a biological theory attempts to describe plants and animals that exist independently of that theory – the biological theory does not define/create organisms. By the same token, theories in political science try to describe political processes, like the succession of a new monarch, which would have occurred even if there were no political science. Because the objects of empirical theories are not defined by empirical theories themselves, empirical theories cannot consist only of analytic propositions. They must contain at least some synthetic propositions that are hypotheses about the objects under study. For example, a physical theory cannot merely give us the definitions of “force of gravity”, “mass”, or “distance”, without telling us how mass and distance affect the force of gravity. Similarly, a biological theory doesn’t merely tell us what it means by “species” or “evolution’, but, importantly, tells us how species evolve through time. It is these relations between different features of natural or social objects (structures, systems, processes, etc.) that any empirical theory attempts to uncover. Thus, hypotheses about these objects, i.e. synthetic propositions, are inevitable in empirical science. The rule of thumb for distinguishing formal from empirical theories is this: if a theory contains no synthetic propositions, it is a formal theory; if a theory contains at least one synthetic proposition, it is an empirical theory. If we consider any theory from any one of the plethora of empirical sciences, we will see that it contains some synthetic propositions, i.e. propositions the opposite of which is conceivable. We’ve already seen this in the example of the law of gravity. The same applies to the chemical formula for the combustion of methane – we can easily conceive of a world with a different set of chemical laws that make methane combust differently, or even not combust at all. The same applies to all synthetic propositions of all empirical sciences. Can analytic propositions be absolutely certain? Can synthetic propositions be absolutely certain? Let’s first consider the former. Is it possible to establish the truth of an analytic proposition beyond any doubt? For instance, can the propositions of math or logic be proven with absolute certainty? The short answer is “yes”, because analytic propositions are either definitions or follow from definitions and, thus, they unfold what is already in a sense implicit in the definitions. Insofar as we stick to a given set of definitions, any analytic proposition that follows from them will be absolutely true. For example, as long as “bachelor” is defined as “an unmarried man”, the proposition “all bachelors are unmarried” will remain absolutely certain. Similarly, as long as we stick to the definitions (including the postulates) of Euclid’s geometry, its propositions will always hold. There is a common misconception in the literature concerning the status of Euclidean geometry nowadays. It is often said that Euclid’s geometry was rejected and replaced by a non-Euclidean geometry when general relativity became accepted ca. 1920. The error here is in the confusion of pure geometry with physical geometry. As a purely formal theory, any geometry defines its own space as a formal object and then provides a description of that space; it doesn’t attempt to say anything about the actual space of our universe. Naturally, the spaces of different geometric theories can be very different: some geometries may define a flat space (i.e. a space where the sum of the angles of any possible triangle is 180°), while others may define a curved space (i.e. a space where this relationship for triangles does not hold true). The resulting geometries will be very different but, importantly, each of them will only contain analytic propositions and will provide an absolutely true description of its own formally defined space. Thus, Euclid’s geometry is still and will always be an absolutely certain description of space as it is defined in Euclid’s geometry. As a formal theory, it doesn’t attempt to accomplish anything more. In contrast, physical geometry attempts to describe the properties of the physical space of our universe. For instance, it attempts to find out whether the space of our universe is flat or curved. Any theory of physics has some physical geometry built into it: for instance, Euclid’s geometry was implicit in Newtonian physics, and Riemann’s non-Euclidean geometry is built into general relativity. But when any geometry becomes part of a physical theory, it ceases to be a formal theory and becomes physical geometry. It now makes hypotheses about the space of the universe and, thus, no longer consists merely of analytic propositions. Such a physical geometry is an empirical theory and is not to be confused with a pure geometry which is a formal theory. Thus, when we say that Euclidean geometry was rejected, we have to keep in mind that it was only rejected as an empirical theory of the space of our universe. As a formal theory, it’s never been and could never be under any threat. This is because it consists exclusively of analytic propositions which, by definition, can never be in conflict with any observational results. This is equally true for any analytic proposition and, consequently, any theory that consists of only analytic propositions. Therefore, the answer to our first question is “yes”: there can be absolutely certain analytic propositions. As a result, we can legitimately speak of mathematicians or logicians proving a certain theorem beyond any reasonable doubt. Now, what about synthetic propositions: can they ever be absolutely certain? Can our hypotheses about the workings of the world ever be proven beyond any reasonable doubt? In other words, can we have absolutely certain theories in physics, chemistry, biology, psychology, sociology, economics, etc.? The short answer to this question is “no”. To appreciate this, we have to consider how synthetic propositions are justified and what problems their mode of justification faces. As we have seen with the example of white swans and the law of gravity, synthetic propositions must somehow be based on experience. So intuitively, we are inclined to think that the justification of a synthetic proposition requires some experience – some experiments and/or observations. This goes for both singular synthetic propositions, such as “swan a is white”, and general synthetic propositions, such as “all swans are white”. Indeed, how else can we justify any of these synthetic propositions, unless we go out there and observe? Intuitively, we are inclined to accept the following general template. In order to justify a synthetic proposition, we find an object, let’s call it p1, and observe that it has some property q. We then find a similar object p2 and observe that it has the same property q. We repeat this with more objects of the same class – more p’s – and conclude that all objects of type p have property q. But precisely because all synthetic propositions must eventually be based on experience, they cannot be absolutely certain. There are three giant obstacles that prevent synthetic propositions from being established beyond any reasonable doubt: the problem of sensations, the problem of induction, and the problem of theory-ladenness. 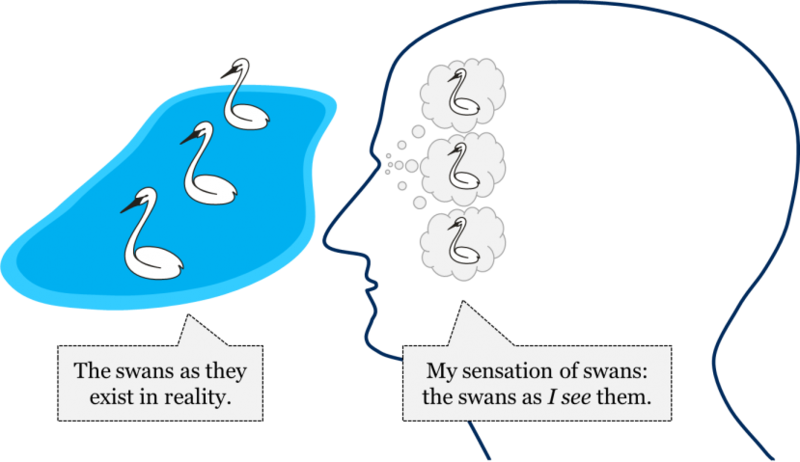 In order to claim that the proposition “all swans are white” is absolutely certain, we have to first establish that our sensations of swans are absolutely trustworthy: we have to make sure that swans as we see them are exactly the same as swans as they exist independently of the human mind. But how can we make sure that swans as we see them are exactly as they are in reality? How can we ever ascertain that our sensations convey the exact image of things as they really are? 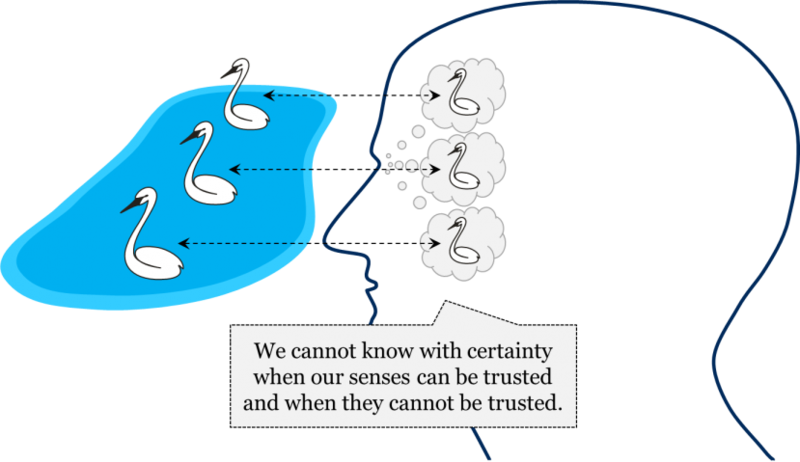 There are reasons to suspect that our senses are not always trustworthy; surely, we don’t normally trust everything we perceive when we are not sober! So, the question of the trustworthiness of our senses is far from idle; if we are going to claim that any of our hypotheses about the external world are absolutely certain, we have to prove that our sensations convey to our minds exact images of the things as they really are. Suppose I see a cup of coffee in front of me. This is my visual sensation of a cup of coffee. How can I possibly make sure that there is really a cup of coffee in front of me? I could approach the cup and pick it up, smell it, and taste it. In other words, I could try to confirm my visual sensations with my sensations of touch, smell, and taste. Now, suppose that my sensations of touch, smell, and taste also suggest that there is a cup of coffee in front of me. Will this guarantee that there is really a cup of coffee in front of me? Of course, not! All it would demonstrate is that my visual, tactile, olfactory, and gustatory sensations cohere with one another. That’s all! But the question was not whether my sensations are in agreement with one another. The question was whether my sensations are absolutely trustworthy. In order to be absolutely sure that the cup of coffee is real, I would somehow have to grasp what the cup is like using a means that bypassed my senses. But that is impossible! We don’t have a way of getting in touch with the world without using our senses. So even when all my senses seem to suggest that there is a cup of coffee in front me, all it really tells me is that I sense that there is a cup of coffee in front of me. What if we asked other people to confirm the presence of the cup? Would that solve the problem? No, it would not. After they observed the cup, they would have to somehow convey the results of their observations to me. There is no way for me to receive their message that does not somehow involve my senses. On top of the fact that other people are relying on their senses, I have to rely on my senses to communicate with them about the information they gathered through their senses. So, all this would tell me is that I have an additional sensation that agrees with my other sensations. The same goes for any tools we might want to use to confirm our sensations. Suppose I was to use some kind of a coffee detector to ascertain that there is a cup of coffee in front of me. Say, the coffee detector had a screen that would display the message “this is coffee”. Would that solve the problem? No, since I would have to read the screen or otherwise interact with the detector and the only way I can do that is though my senses – visual, auditory, etc. Therefore, I would only have one more sensation that is coherent with my other sensations. In short, in order to be in a position to say that there is a cup of coffee in front of me, I have to be absolutely sure that my senses conveyed the exact picture of the cup as it really is. Yet, this cannot be guaranteed. All I can check is that my sensations are in agreement with one another, but that doesn’t necessarily guarantee that the world out there is exactly as my sensations suggest. This is known as the problem of sensations: there is no guarantee that senses convey the exact picture of things as they really are. It is even possible that we might be living in a computer simulation; we just don’t have an absolutely certain way of knowing that we aren’t! While there have been many attempts to solve the problem of sensations, it is accepted nowadays that strictly speaking it cannot have a solution. One suggested solution was to argue that because our senses are a product of evolutionary processes, they have adapted to perceive the world correctly, for otherwise humans wouldn’t survive. Is this a good solution? No, it’s not, because it is based on the theory of natural selection, which is itself an empirical theory; the proposition “our senses adapt to their environment” is a synthetic proposition which can only be justified by invoking knowledge obtained with the use of our senses. Thus, the solution is itself circular: in order to show that our senses are trustworthy it invokes the theory of natural selection, but in order to justify the theory of natural selection we need to rely on evidence obtained with our senses. Importantly, the problem of sensations in general doesn’t mean that we cannot trust our senses; not trusting our senses wouldn’t be particularly conducive to our survival. The point here is not that our senses are deceiving us – no! The point is that we just cannot be absolutely sure that they are not deceiving us. 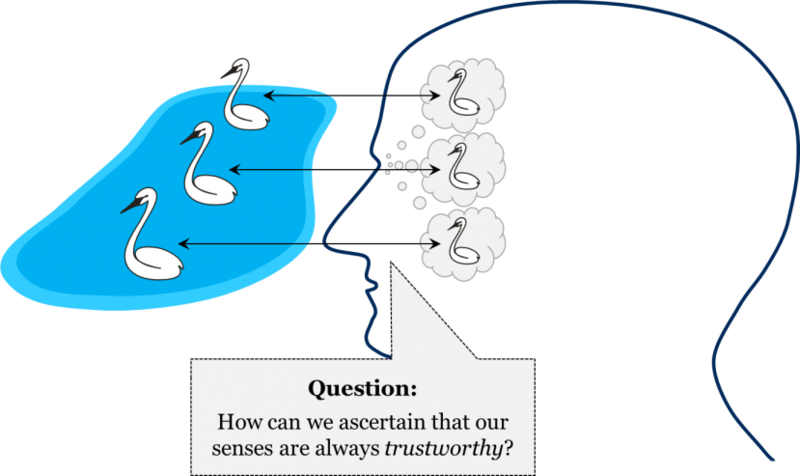 There is a very important difference here: it’s one thing to claim that senses are not trustworthy, it’s another thing to claim that we cannot know whether they are trustworthy or not. The problem of sensations is all about the latter: it tells us that we simply cannot be absolutely sure that our senses are not deceiving us. Suppose for the sake of argument that there is no problem of sensations; suppose that our senses are absolutely trustworthy and convey the picture of the world as it really is. Even if we were to make this assumption, we would still be facing a serious problem. Anytime we observe something, the outcome is a singular synthetic proposition, such as “swan a is white” or “swan b is white”. Question: how can we ever prove any of our general synthetic propositions if the outcomes of our observations are always singular propositions? In other words, how is it possible to claim that all swans are white if our observations only tell us that individual swans we have observed so far are white? Is there any guarantee that there won’t be any non-white swans out there? Similarly, how can we ever be sure that the law of gravity has been proven beyond any doubt? As a general synthetic proposition, it must be based on observations, but all our observations concern individual cases. We can observe that the law holds between the Earth and the Sun, or the Sun and Jupiter, and so on, but does this prove that the law holds for any two objects in the universe? In other words, how can we be sure that our inductive generalizations hold water? Because general propositions refer to all objects within a given class, they attempt to say something not only about those objects that we have already observed, but any object of that type. To establish “all swans are white” beyond any reasonable doubt we should make sure we have observed each and every swan out there, including all swans that have ever lived and all swans that will be born in the future. Surely, this is impossible! But if we are never in a position to observe all swans, how can we be absolutely sure that all swans are white? It would suffice to observe one counterexample – one non-white swan – and the whole generalization would fall apart. Thus, no matter how many millions of white swans we have managed to observe, there is no logical proof that the swans we will observe in the future will also be white. Similarly, we can observe millions of instances of objects acting in accord with the law of gravity, but this doesn’t prove that all objects in the universe obey this law. Even if all the physicists in the world were to collect their observational results in a huge database, the outcome would still be limited; it would never cover all objects in the universe. This is the gist of the problem of induction: because our experience is always limited, our inductive generalizations are inevitably fallible. The only exceptions here are those rare cases, where the number of objects within a class is finite and we have managed to observe each and every one of them. For example, the proposition “all capitals of Rus’ were located between 45° and 60° northern latitude” doesn’t face the problem of induction, since Rus’ had a finite number of capitals and all of their locations are known. However, in most cases, there are so many objects within a class that we simply cannot observe all of them. In those numerous cases, our generalizations remain fallible because of the problem of induction. With this wonderful principle of the uniformity of nature, we are no longer required to make an infinite number of observations to prove a general synthetic proposition. Now, does this solution hold water? It is true that if the principle of uniformity were established beyond any reasonable doubt then it would solve our problem. But how do we know that nature is regular and uniform? How is the principle of uniformity itself justified? There are two options here. Option 1: We can try to argue that the principle itself is an analytic proposition, i.e. that it is true by definition. But this is not a viable option: the principle of uniformity is not an analytic proposition, since its opposite is conceivable. For instance, we can easily conceive of a world where regularities allow for exceptions. We can equally conceive of a world with no regularities whatsoever. Clearly, the principle of uniformity itself is a synthetic proposition – it is a hypothesis about the workings of our world. This leaves the second option. Option 2: We can try to argue that, as a general synthetic proposition, the principle of uniformity is justified through thousands of years of human experience. We see regularities everywhere around us and we see that these regularities don’t change through time: apples have been falling to the ground since time immemorial and they still fall down just fine. Thus, the principle of uniformity is based on our observations that in similar conditions objects of the same type have always behaved similarly. In other words, the principle is itself an inductive generalization of our past experience: it assumes that objects of the same type will always behave similarly because that’s how they have behaved so far. Thus, the principle of uniformity faces the same problem as any other general synthetic proposition – the problem of induction. Therefore, we cannot solve the problem of induction by means of the principle of uniformity, because that would lead to a vicious circle: we would use the principle of uniformity to guarantee the absolute certainty of our inductive generalizations, but we would also use induction to justify the principle of uniformity itself, which we would then use to justify induction, which would then justify the principle of uniformity, and so on. We would end up in a vicious circle! 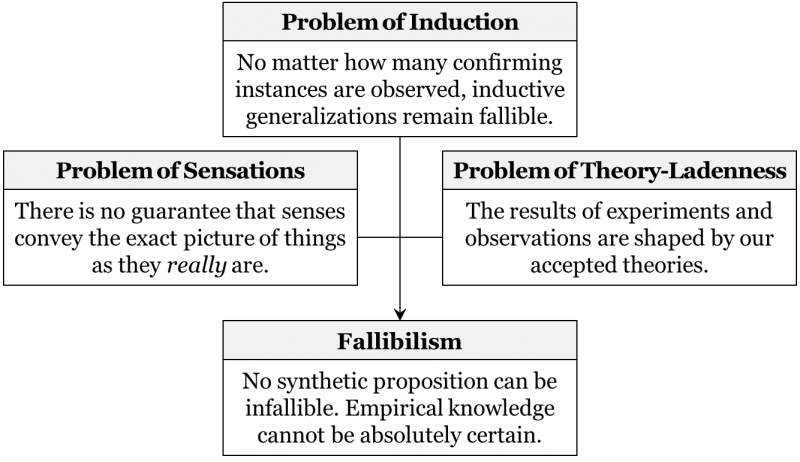 It is accepted nowadays that the problem of induction doesn’t have a perfect solution and, therefore, our inductive generalizations based on limited experience are fallible. Of course, this doesn’t mean we have to stop making inductive generalizations; all it suggests is that these generalizations are not absolutely certain. We cannot and should not avoid drawing general conclusions; we just have to appreciate that they are not proven beyond any reasonable doubt. What do we see here? Those of us without astronomical training will probably see some stars obscured by what seems to be a cloud of poisonous gas. 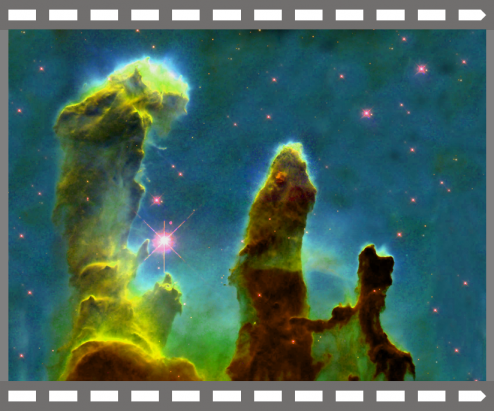 However, people trained in astronomy would most likely say that this is the Pillars of Creation, a photograph of interstellar gas and dust about 7000 light-years from Earth in the Eagle Nebula. 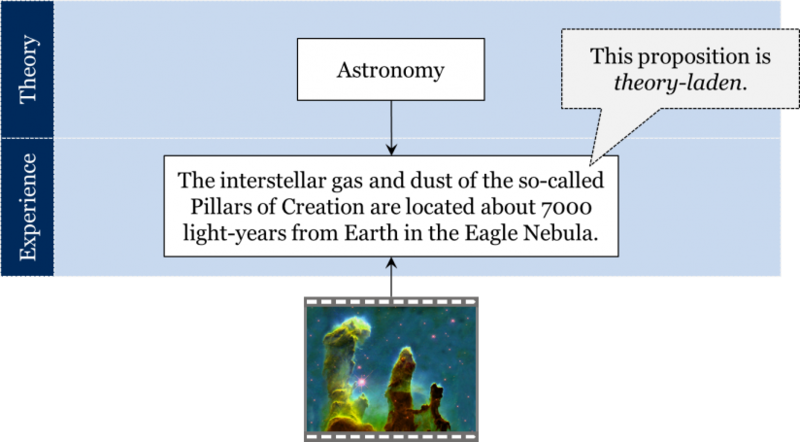 In other words, our observation of the Pillars of Creation is laden with our astronomical theories. This phenomenon is known as the theory-ladenness of observations. It is nowadays accepted that all observations are theory-laden, i.e. they depend on some accepted theories. Another way of saying the same thing is that there are no pure statements of fact, in the sense that all statements of fact presuppose one theory or another. Note that here “pure” means “unaffected by any theory”. The point is that no observational statement is pure: all observational statements are shaped by one theory or another. What is this? While a layman will probably see a fuzzy greyish picture, a person educated in neurophysiology will see a synapse. More specifically, an educated person will see a presynaptic terminal in the upper right portion of the image and a postsynaptic terminal in the lower left. They will recognize the presynaptic terminal by the small dark circles it contains. They will see these circles as packets of neurotransmitter molecules called synaptic vesicles. 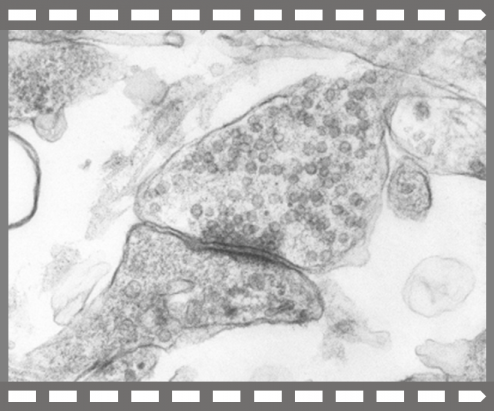 These vesicles can release neurotransmitter into the thin gap between the presynaptic terminal and the postsynaptic terminal, which is called the synaptic cleft. 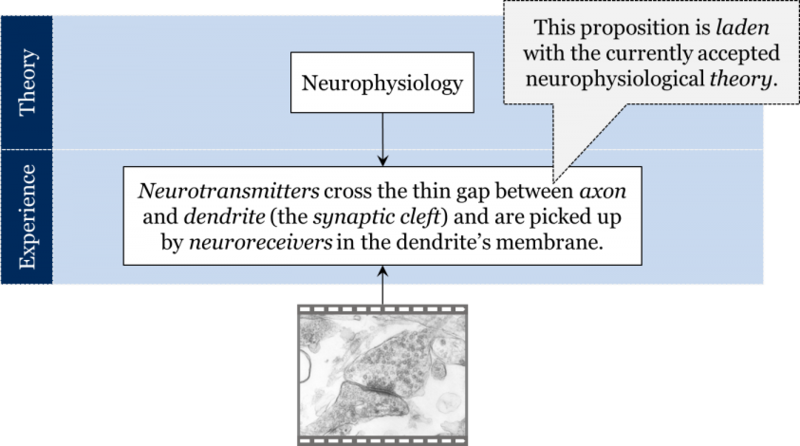 Neurotransmitter molecules can cross this gap and bind chemically to receptor molecules on the postsynaptic terminal. But this understanding is only possible if we accept some of the theories of neurophysiology. This is another example of our accepted theories shaping the results of our observations. The general point here is that all propositions that describe our experience are inevitably theory-laden: there are no pure statements of fact. To appreciate this point, let’s take another example. Suppose we look at the Moon through a telescope and observe that it has mountains. Why is this not a pure statement of fact? 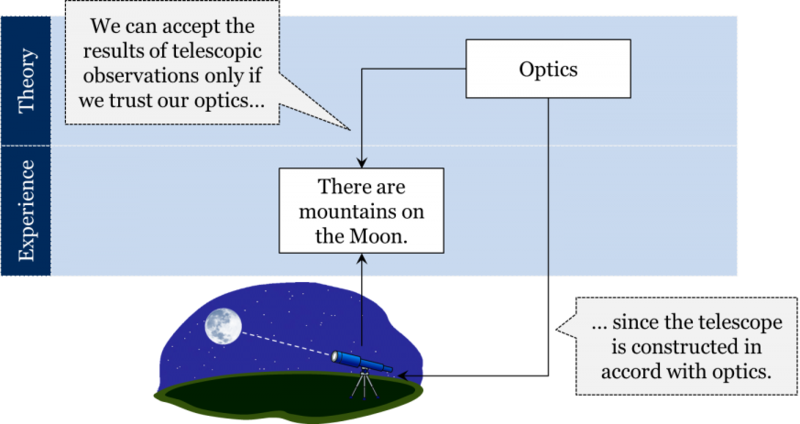 The proposition “there are mountains on the moon” is not a pure statement of fact because it assumes the reliability of the telescope. But the reason we rely on the telescope is because we know that it was constructed in accord with our accepted optical theory which suggests that a certain combination of magnifiers produces a trustworthy image. Generally speaking, any observational instrument presupposes one theory or another and, therefore, the observational results obtained by means of an instrument depend on the theories in accordance with which the instrument is constructed. But what about those cases where we don’t seem to use any instruments? Suppose I look out the window with my naked eye and say, “it’s raining”. How is this proposition theory-laden? Surely, I am not using any instruments, so what theories are presupposed here? Even in this most simple case, my observation is based on some basic assumptions about my own physiology and about optics. In fact, we do not trust our observations at all times, but only when they satisfy certain basic criteria, such as proper illumination, the absence of visual obstacles such as fog, not having taken a hallucinogenic drug, nor subject to hallucinations due to malnourishment or sickness, etc. For instance, when a teaspoon appears bent or broken in a glass of water, we don’t trust this sensation, for we have some prior knowledge of how these things work. We essentially rely on some basic experiential knowledge of optics. Once again, it doesn’t matter that these theories often remain unarticulated; what matters is that any observation – even a naked-eye observation – is based on some theoretical assumptions. At the very minimum, there are some physiological and optical assumptions that allow us to determine which sensations to trust and which not to trust. Thus, there are no pure statements of fact; all observations are theory-laden. The problem of theory-ladenness becomes especially daunting once we appreciate that the theories through which we see the world change through time. Effectively, the same image can be interpreted differently depending on which set of theories we use to interpret it. Consider the example of a falling apple. 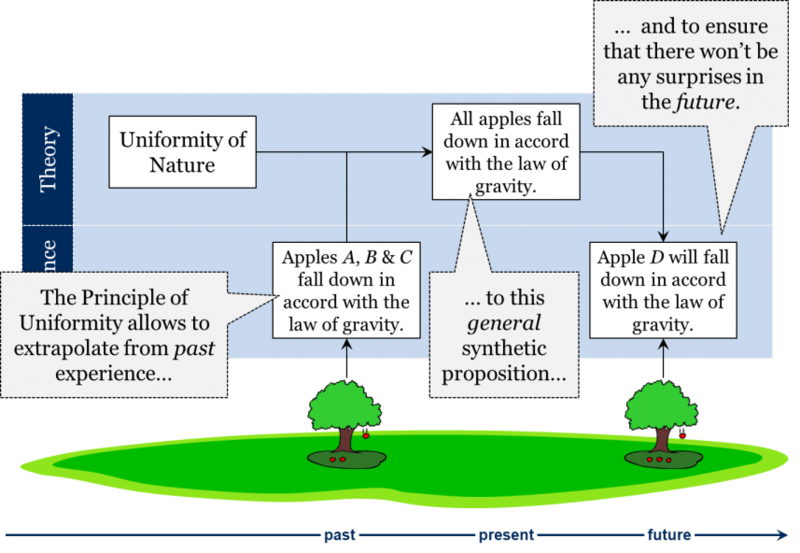 Where Aristotelians would see a heavy object composed predominantly of the elements earth and water descending towards the centre of the universe, Newtonians would see a gravitational attraction between the Earth and the apple. In contrast, nowadays we would interpret this as a case of inertial of motion in the curved space-time continuum produced by the Earth’s mass. Similarly, where chemists of the mid-18th century would see dephlogisticated air, we would see oxygen. The same goes for any observation in any field of inquiry. the problem of theory-ladenness: the results of experiments and observations are shaped by our accepted theories. Together, these three problems suggest that synthetic propositions cannot be established beyond any reasonable doubt. Thus, we arrive at the conception of fallibilism, which holds that no synthetic proposition is infallible and, thus, empirical knowledge cannot be absolutely certain. The table begins with a formulation of the question at issue (the topic): can there be absolutely certain synthetic propositions? It then presents the two opposing answers to the question – the two conceptions (positions, viewpoints). Finally, the table lists the reasons (pros and cons) for and against these conceptions. The table shows that there are good reasons to accept the conception of fallibilism, which is exactly what contemporary philosophy does. 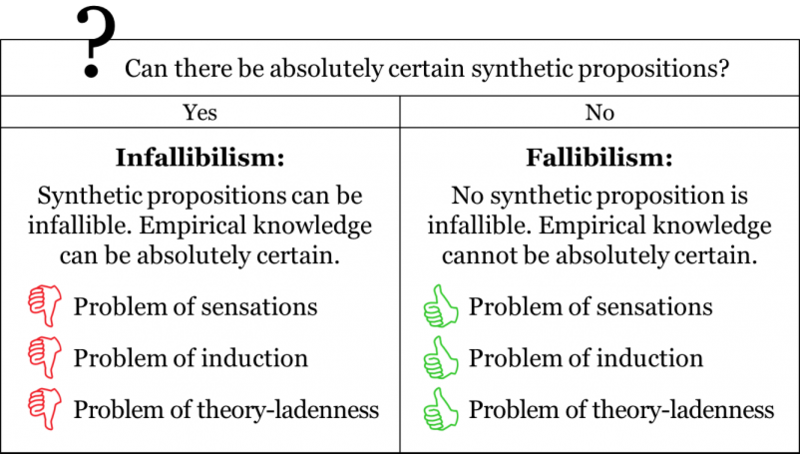 It is important to repeat that fallibilism doesn’t suggest that we have to stop relying on our senses, making inductive generalizations, or describing our observations by means of our accepted theories. In fact, all sciences still do this and that doesn’t impede their advancement. The point here is that because we make observations and generalizations, our synthetic propositions are inevitably fallible, i.e. they are not absolutely true. This brings us to our answers to the two questions we formulated at the outset of the chapter. Can analytic propositions be absolutely certain? Yes. Can synthetic propositions be absolutely certain? No. Now, if there is no such thing as a strict proof in empirical sciences, does this mean that every empirical theory is as good as any other? Are all competing empirical theories equally good, or is there a way to compare competing theories and find out which one of them is better? It is true, that all empirical theories are affected by the problems of sensations, induction, and theory-ladenness; all empirical theories without exception are fallible. Yet, we still find some of these empirical theories acceptable. Does this mean we have a way of knowing which of the fallible empirical theories are acceptable and which are not? This is the key question of the next chapter. Chapter 2: Absolute Knowledge by Hakob Barseghyan, Nicholas Overgaard, and Gregory Rupik is licensed under a Creative Commons Attribution 4.0 International License, except where otherwise noted.